Peek-A-Boo Patterns specialises in furniture and decor for children who need their own space as individuals. 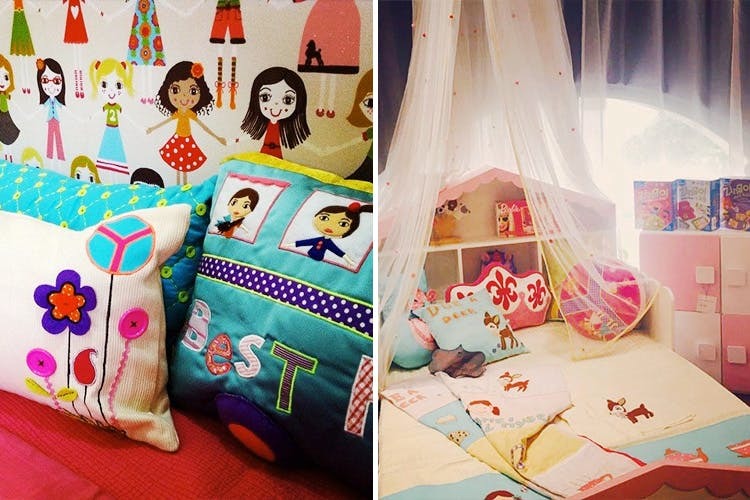 They work with designs for babies and pre-teens, and set up concepts around what suits their personality and space best. Peek-A-Boo Patterns is not just limited to designs and furnishing, but also work on décor, accessories, linen and other lifestyle decorative items for the little ones. So if you’re looking to do something funky with the kids room, these guys will help you out all the way. Ideally, bright colours and lit rooms with colourful accessories work wonders for your child’s cognitive skills, so keep that in mind, when you give these guys a call for some quirky ideas. We found them at the India Design ID festival in Delhi and completely fell in love with their collection. Definitely try out their bed linen collection and their baby stuff. If you’re up for experimenting with some décor for the kids room, check out their wall stickers and their bean chairs, which by the way, are mighty cute. You can check their stuff out here. If you’re new parents, or parents to a pre-teen/tween, you can always furnish or re-furnish your little ones room Peek-A-Boo style and give them some happy memories to live with.